Discover (or rediscover) your inner artist by creating a light sculpture, wall collage or object. Duration: Two afternoon sessions of three to four hours each. Introduction to the creation of handmade paper, and creation of super-soft paper made of plants. Sculpting a small light sculpture or wall collage. €100, including materials (€80 if you’ve attended the course before). Eight participants. The courses begin at 3 p.m., or at a different time by arrangement during the course. Ideally, the courses will be held on Fridays and Saturdays, since the raw materials needed for the artworks take at least 24 hours to dry, depending on the weather. Alternatively (and by prior arrangement), sessions can be held on a combination of Friday/Saturday and Saturday/Sunday. When registering, please indicate one or two preferred alternative dates. You can register by calling me at 0163 260 53 65, or by sending me an e-mail. During the course, we will create light sculptures, wall collages or sculptures – the choice is yours. You can also, if you wish, optimize the design of a lamp that you bring in from home. You will work on your own individual project, under my supervision. The courses extend over two afternoons. 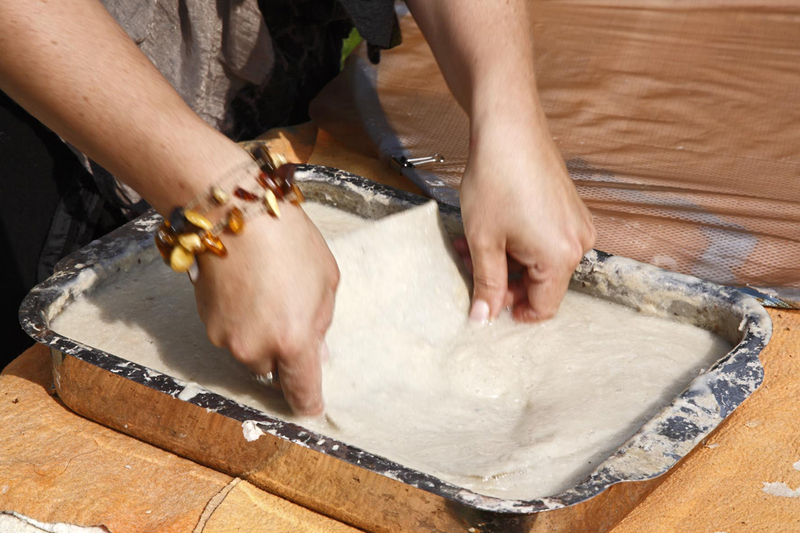 During the first session, you’ll learn the basics of creating handmade paper and will find out which organic and recycled materials are suitable for papermaking. We will create paper pulp from natural, seasonally available materials, and will then use this pulp to create super-soft handmade paper. Duration: three to four hours. 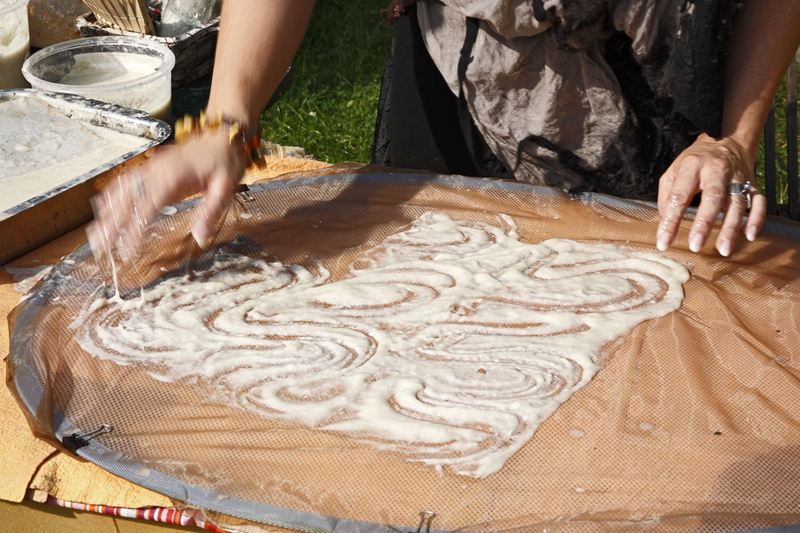 The paper you’ve created will dry overnight, so that we can sculpt it on the following day. Duration: three to four hours. 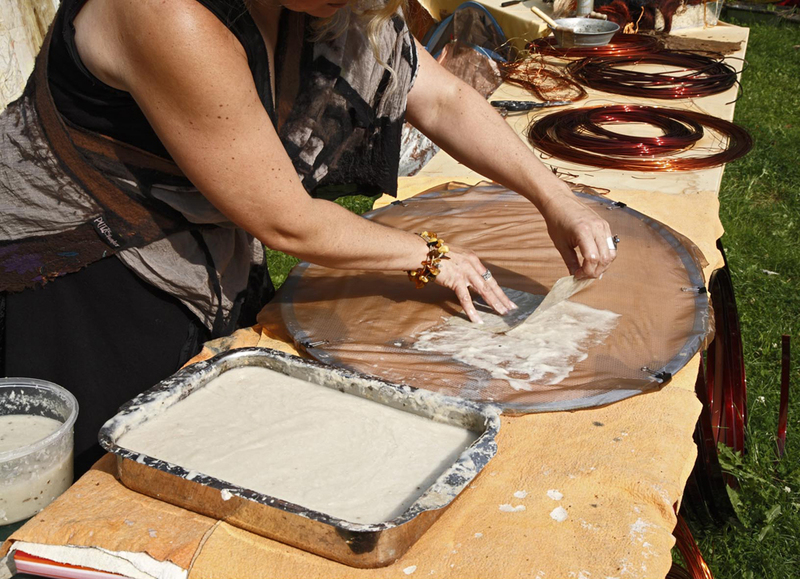 During both sessions, there will be ample time for you to have a close look at my list of papermaking tips. Discover (or rediscover) your creative powers. Each group will have around eight participants, so as to allow each person to realize their own highly individual work. The course fee is €100, including materials (€80 if you’ve done the course before). The course fee also includes beverages and yummy snacks. So why not take advantage of this opportunity to bask in the relaxing atmosphere of my studio, and to work outdoors, weather permitting. A group of this size is also ideal for designing a workshop that’s exactly tailored to your specific interests. Possible topics (among many others) include team building, in-service training for teachers or social workers; or simply a highly enjoyable creative leisure time activity that you can do with friends. A course with more (or fewer) than eight participants. Courses designed for individuals with specific physical limitations e.g. people who cannot stand, kneel or sit for extended periods; people who have difficulty getting up out of a chair or off the floor. A course involving the use of particular paints, colors or materials.